Rotala indica, a slow-growing plant that’s worth the effort, especially in certain situations where it excels. 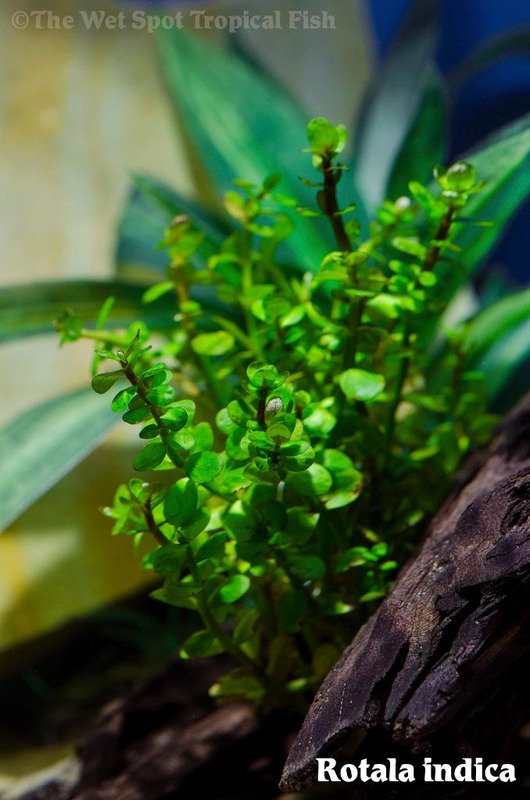 Rotala indica, otherwise known as “Indian Toothcup,” is often described as a miniature version of Lemon Bacopa. Both plants have fleshy leaves and stems as well as a tendency to grow in an upright fashion. These plants however belong to completely different families and have widely different care requirements. Whereas Lemon Bacopa is undemanding, the heavy nutrient, light and CO2 requirements of Indian Toothcup presents a challenge to the new hobbyist. There are varying opinions as to how fast Indian Toothcup grows. While some sources may cite it as a fast grower, most indicate slow growth. Why bother with Indian Toothcup at all? It is particularly well suited to nano-aquarium set-ups where slower growing plants are a boon. Plus, it’s a beautiful plant that will spread once established. When used in larger aquariums, Indian Toothcup is a beautiful mid or foreground plant, provided it is not placed in shade. When pruned, two new stems will appear from the cut section allowing you to plant the growing portion you pruned off and enjoy more Indian Toothcup. Plant Spotlight: Hygrophila pinnatifida "Miramar Weed"
Plant Spotlight: Hygrophila corymbosa "Angustifolia"
Here at The Wet Spot Tropical Fish store, rooted on the west coast and lovingly grown in Portland, Oregon, our goal is to make the aquarium hobby fun and accessible to everyone. We pride ourselves in providing only the best fish and aquarium supplies. We have a friendly and knowledgeable staff, and we strive to form long-lasting relationships with our clients.